Only a handful of golf courses around the world feature a bye hole, and Old Palm Golf Clubâs spectacular Raymond Floyd-designed course is one of them. Traditionally, the bye hole is an extra, 19th hole at the end of the round that is used to settle bets. 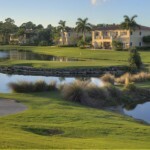 At Old Palm, itâs a heroic-style, 99-yard Par 3 over water to an island green. The hole is not only used for friendly post-round bets, but also to add competitive fun to events at the Club. During Pub Nights, members often play the hole by teeing off from the Clubâs event lawn. The term âbye holeâ takes its name from those holes not played after a match has been won. For instance, if a player is three holes up with only two holes left, he wins the match. The competitors can either stop at that point or play the remaining or âbye holesâ for fun or for a separate bet.